For some reasons the bus was suddenly shocked. I found myself awaking among the grassy hills of the Yorkshire Dales that were almost entirely green, spreading to the distant blue swell of the hills. There were various green tones of the meadows and those trees. 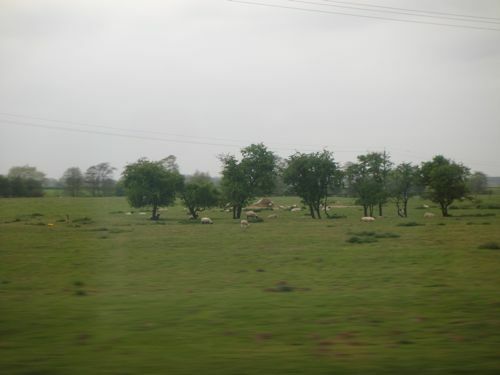 From the windows, I could see the cultivated lands and solid grey-stone farmhouses among them. Farms with horses, cows, and sheeps. Sunlight still tried to sneak into the gray clouds when the bus passed along narrow streets of a small town. Less than a minute, the bus had stopped next to a small clock tower. It must be the market place, with the gravel streets. The market place was functioned as parking area for the cars. It was surrounded by various colours of shops, and narrow streets. A “Co-operative Shop” sign over a grocer shop caught my attention, and made me smile. We stepped down, and set foot on Darrowby. 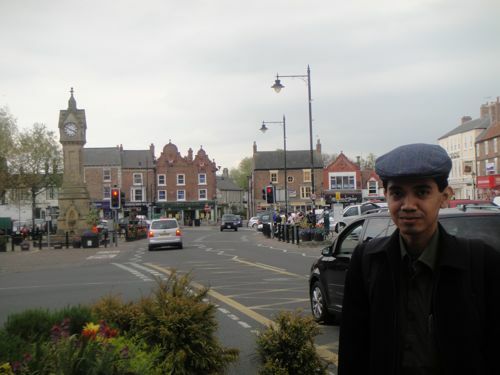 I often blog this town in both my Indonesian and English blogs. 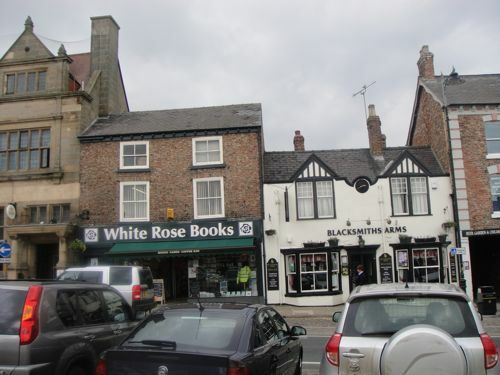 Thirsk, a small town in Yorkshire. 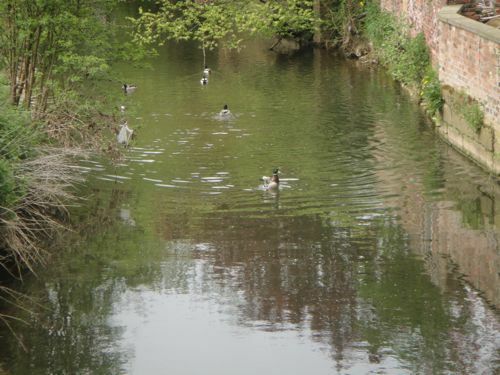 A veterinarian who was also a powerful writer, with a pseudonym James Herriot, has introduced this city in his books to the world as Darrowby. It is his first book — If They Could Talk — which led me to this city. A photographer from The Darlington and Stockton Times, Richard, had waited for me just beside the clock tower. While I admired the clarity in the air, he took some pictures of me with Herriot’s book. Then we just walked, following Herriot’s steps. 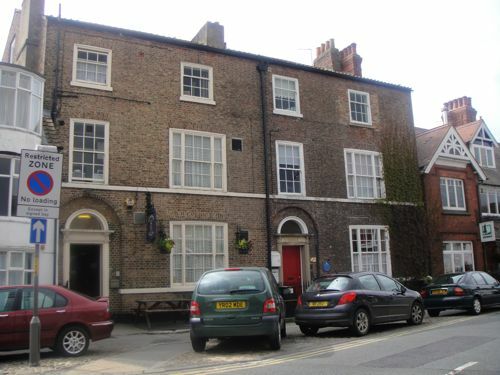 Kirkgate was a quiet street leading off the square and I had my first sight of the Skeldale House. Richard left us there. Unlike James Herriot when he first saw this house, I did not feel breathless. I came with a smile, to a house I wanted to see since my childhood. I knew it was the right place even before Richard told me, I knew by the ivy which climbed untidily over the mellow brick to the topmost windows. It was like Herriot mentioned – the only house with ivy. It was Georgian with a red door and white-painted windows. Also unlike Herriot, I didn’t need to press the bell and heard those five dogs barking loudly. Margaret had been in front of the house and a welcomed us friendlily. We shared a crunchy and fun chat, until finally she told us to buy the tickets in the house next door. “Follow me, Luv,” she said. Then with her Yorkshire accent (it was much better than West Midlands accent, btw), she told us what had happened after those books. 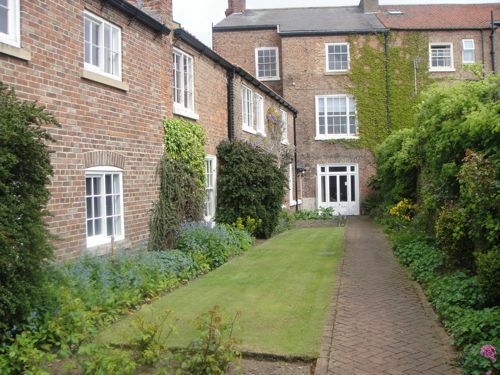 James’ children are still living in Thirsk: Jim as a vet and Rosie as a medicine doctor. The historical house has been converted into a museum since 1995. Margaret also asked, how someone from the other end of the earth could find Skeldale House. Haha. It is surely the magic of the Internet. Finally I was allowed to enter the house. First I read the name “D.V. Sinclair MRCVS” on the brass plate, and the name “J.A. Wight MRCVS” on the other plate, white over black. I rang the bell. Rrrrrring. Still no dogs barking. We had to open the door by ourselves. 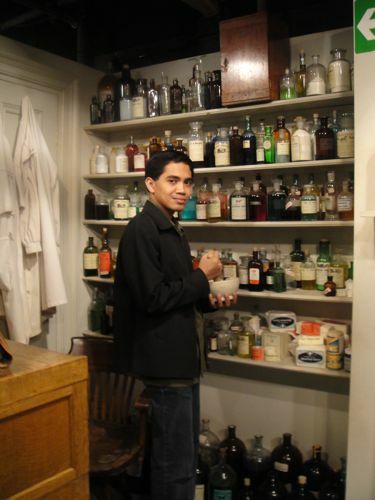 Inside the house, the rooms are maintained as the original: the formal dining room, family room, medicine room, surgery room, breakfast room, and the hallway to the living-room behind. I could imagine Tristan riding his bike in that little alley. Everything seemed like a dream that manifested itself out of the books I read and read again for many years. 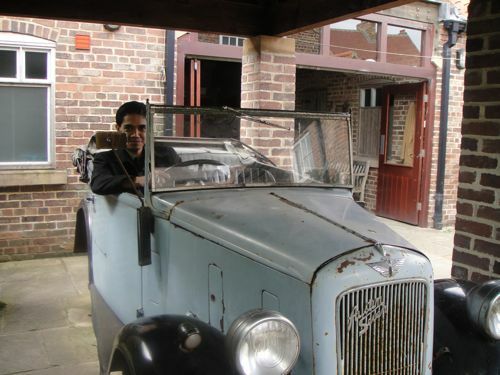 I might even drive James’ old Austin, but not exceeding the speed of 0 mph. Behind the garage, a room was prepared to get to know James more personally. I have blogged this too often too. 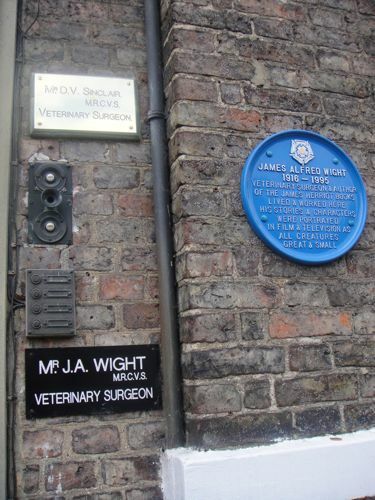 James Herriot’s original name was James Alfred Wight. He was called Alf, born in Sunderland but grew up in Glasgow. His parents chose Glasgow to build families and raise children with good culture. Alf loved classical music and liked to write a diary. 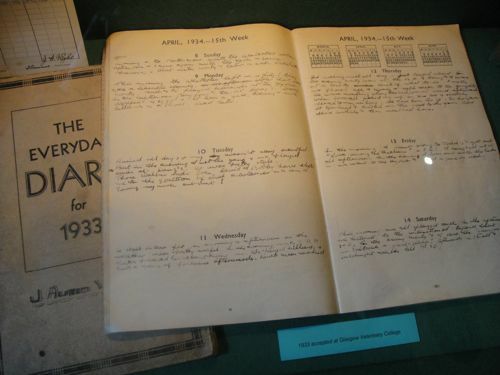 I was amazed and fascinated to read the diary of young Alf, written almost every day. But a professor came to his school and made him suddenly want to explore science and become a veterinarian. He enrolled at Glasgow, where the students attending college not seriously. But eventually he graduated. He worked in the Northern part of England, then moved to Yorkshire, for a veterinarian named Donald Sinclair in the town of Thirsk. Yorkshire, its environment, the citizen, and the challenges, had made Alf felt at home in this city. He got married and and raised his children here. Herriot book series are guaranteed to make you understand why he did not want to go from here. He enjoyed his life. Enjoying classical music, journal writing, educating the children. But hard work did not always make money. His savings was only £ 20. He got the idea to rewrite his diary into a book. Joan, his wife, commented that none could begin to write at the age like this. 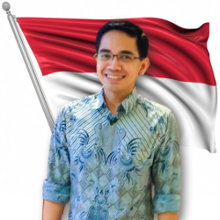 But he started writing, and after several years of rejection, the book was finally published and became a great success on both sides of the Atlantic, then translated into various languages, including Indonesian. Entering the next room, which is already part of a neighboring house, a black telephone rang. I felt as is the old Donald a.k.a. Siegfried instructed: “Pick up the phone!” I picked up the phone. A farmer’s voice was at the other end, in a dialect I could not recognise, complained about the condition of his livestock, and then he immediately slammed his phone. I put the phone slowly. We walked around Thirsk. The marketplace is surrounded by a crowded store: bookshops, café, sweet shops (hey, maybe this was where Alfred the cat lived — a cat that required surgery because it has hair balls inside his stomach), the banks. Continue to the outside, a bridge stretching over a creek, etc. Darrow river, wrote James in his book. On the alleys: the houses of red brick; and behind: the hills and valleys livestock animals were released on the vast grassland. Life did not seem complicated here. I walked slowly in the city that for years has always been inspiring me to be optimistic, to see all aspects of life as a bless, to face the world with love but also with tough endeavour, to admire the heterogeneity of human kind and thought. A city that in its way has constructed me the way I am now. “Jump in,” shouted the coach driver. We jumped into. Back to York. Thank you so much for your lovely photos and story! My daughter, McLain who is 8 and I share a huge love and admiration of James Herriott. When she was asking me what Darrowby looked like we tried a search and found your perfect description of what we were looking for. Blessings from Athens Ga! I know how you feel. The curiosity, the longing to an inspiring story, etc. Those feelings has brought me to Darrowby to see the town and the house I wanted to see since my childhood. I hope someday you will visit that town too :). When I was an exchange student in the UK in 1989, I went looking for Darrowby. Despite my older relatives (I had some living around Manchester) laughing at me, I did find it. The weather was rotten the day I took a bus from Ripon to Thirsk, and I had to fortify myself with a newspaper of fish and chips before I wandered down Kirkgate. Dr. Wight was still alive then, and there was no way to visit the house without being disruptive to a business. So I took pictures of the red door and the plaques from a distance. I walked around and looked at the back windows. I was assured that no one lived there then, so it was just the working veterinarian practice. I was in town the wrong day for Dr. Wright’s visits to the local bookstore, but I remember feeling very touched. I loved his stories so much. @Russel: Mind to send me the pictures you’ve taken in 1989? I’m really curious to see the picture of the house when Dr Wight was still working there.